A religion of South Asia, which was developed from the Vedic religion. The sacred texts of Hinduism are called The Vedas. Hinduism has 4 deities, Brahma, Lakshmi, Shiva, and Vishnu. Brahma is the first god in the Hindu triumvirate. The triumvate has 3 gods, which are responsible for creating, upkeeping, and destroying the world. 300 million people around the world worship Buddhism. 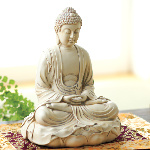 The word Buddhism comes from 'budhi', which means 'to awaken'. Some people treat Buddhism like a philosophy or a way of life. Buddha, the deity/god of Buddhism, is called "The Monkey King" by Buddhists. A lot of Buddhists meditate. Buddhists believe meditating is a method for understanding and working on their own minds. Buddhism is a philosophy to some people because it means 'love of wisdom', and because of the Buddhist path. The Buddhist path is to lead a moral life, to be mindful and aware of thoughts and actions, and to develop wisdom and understanding. Buddhism is becoming very popular, espically in western countries, mainly because Buddhism has answers for many problems in modern societies. Confucianism was founded in China in the 5th-6th century BCE. Confucianism, also known as Rujiao, is a way of life that was first taught by Kong Fuzi. Sometimes it can be viewed as a philosophy or religion, but sometimes it is not viewed that way. Confucianism has deeply influenced spiritual and political life in China; it has also extended to Korea, Japan, Vietnam, and more countries. Shintoism is derived from the word "Shinto", which means "way of the gods". Shinto shrines are marked with an archway, which is called a torii. The torii is thought to separate the sacred world of the shrine from the rest of the world. The most important spirit in Shintoism is Amaterasu, also known as the sun goddess. She is thought to be one of the ancestors to the emperors of Japan. Many Japanese people practice both Shintoism and Buddhism because the beliefs are compatible with eachother and they are also not contradictory.